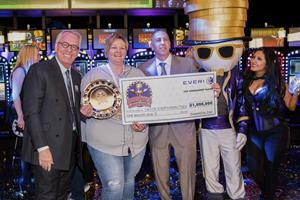 LAS VEGAS, Oct. 12, 2018 — Everi Holdings Inc. (NYSE: EVRI), (“Everi” or the “Company”), the casino gaming industry’s only single source provider of gaming products and financial technology solutions, crowned Tanya S. representing Pines Restaurant & Casino, Evergreen Park, in Grande Prairie, Alberta, Canada, the winner of its sixth annual TournEvent of Champions® The Million Dollar Event® on October 10 at XS Nightclub in the Wynn/Encore Las Vegas Resort. Tanya S. walked away with the grand prize of $1 million* and a cruise for two on a Norwegian Cruise Line® ship, having overcome 166 competitors and bringing to a conclusion the premier slot tournament in North America. About Everi Everi is a leading supplier of technology solutions for the casino gaming industry. The Company provides casino operators with a diverse portfolio of products including innovative gaming machines that Powers the Casino Floor®, and casino operational and management systems that include comprehensive, end-to-end financial technology solutions, critical intelligence offerings, and gaming operations efficiency technology. Everi also provides proven, tier one land-based game content to online social and real-money markets via its Remote Game Server and operates social play for fun casinos. Everi’s mission is to be a transformative force for casino operations by facilitating memorable player experiences, delivering reliable protection and security, and striving for customer satisfaction and operational excellence. For more information, visit www.everi.com.